Balakrishnan's Managerial Accounting 2nd edition presents accounting information in the context of a unifying problem-solving framework that shows students the why behind the what and how. Through the framework, students begin to understand the principles driving business practices and learn to adapt to changing business circumstances. Throughout this text students learn to systematically measure costs and benefits to make effective decisions. By linking business decisions with accounting information students will be motivated to learn and make more informed decisions. Accompanied by WileyPLUS, astudent-centered learning and assessment online environment, where students complete automatically graded homework, get feedback on their answers, and access learning materials like the eText at the point of learning. Students come to class prepared because the program is a designed to meet the needs of today’s accounting. 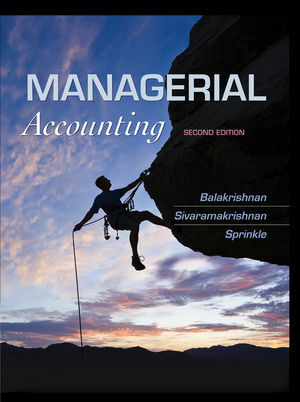 Ramji Balakrishnan and Konduru Sivaramakrishnan are the authors of Managerial Accounting, 2nd Edition, published by Wiley. Chapters 1 and 2 revised to place a greater emphasis on the concept of relevance and its importance for decision making. We have reduced the extent of discussion previously devoted to the notion of controllability although we still stress its importance in understanding costs and cost structure. Added numerous end-of-chapter exercises and problems. Updated examples in the “connecting to practice” callouts. Clarified language in numerous end-of-chapter exercises and problems to remove ambiguities. Edited language for additional clarity and accessibility. Strategic Framework: The modules used to organize this text allow students to quickly and logically relate accounting information to business decision making. Each module presents cost estimation and planning decisions in both the short-term and long-term context, while presenting budgets as devices that link planning and control decisions. Applying the Decision: Within each chapter the book explores a specific decision problem framed in a 4-step manner. This framework is presented at the beginning of each chapter, and students are asked to analyze it throughout the chapter. It is then revisited near the end of the chapter for a decision recommendation. End-of-chapter material features an excellent balance of quantitative and qualitative problems. The problems are set in the manufacturing and service sectors. Each chapter also contains EOC materials that focus on non-profit organizations. Chapter Connections: Each chapter begins with how the current material relates to the prior and subsequent chapters. Throughout the text, Chapter Connections link the decision problems to concepts in earlier chapters. Well qualified and respected author team. All three authors on this text are published managerial accounting researchers and have taught introductory managerial accounting.